Think it's a great technique you have shared, and I don't think it's as "pointless" as you seem to suggest. Dataset splitting can be an I/O, cpu cycle, and disk space saving operation depending on the actual requirements of the project/task. Using the example of the graphic provided at the head of the article, If, for example, the data subsets for Asia, Europe and USA are being provided to distinct groups/entities for their own intelligence/analysis then data splitting might be the efficient solution. If each group/entity intends to host it's own dataset, file transfer overhead and diskspace is certainly reduced in sending three subsets, compared to three complete copies of the total dataset. Even if each entity isn't hosting its' own dataset, as the number of sub-setting where-clauses generated by each groups efforts grows, there's the potential for I/O and CPU costs to exceed the cost associated with the initial file-split. Thanks for the insight, Chris. I agree that there are good use cases for splitting data, hence the proliferation of many %split macros in SAS Global Forum papers. The reasons that you cite are thoughtful and reflect what I've seen in practice. please tell me chris where I have to run all that commands for splitting the big datasets ? Moin, you can run the macro that I've presented here -- in your SAS environment - or select from a variety of other techniques covered in SAS Global Forum papers from years past. Of course we can find a cautionary note.... using a hash based method assumes the memory is available. I am not a fan of taking one big dataset and slicing it into smaller pieces. Doing so creates a lot of clutter, and even worse tends to create orphans that don't receive updates when the original dataset is refreshed. But sometimes it's necessary for various reasons. And when it is, this is a very good automated way of cranking them out. This functionally splits the master table for any users, but leaves each of the subsets dynamically connected to the master source table so they get updates, and also does not double-up on the physical storage space. I would agree double storage of the data might not meet your optimization goals. However, there is a role for double storage and denormalized data. Might I suggest, that the use of an index pre-suppose that values of ORIGIN have a high level of cardinality. If the ASIA comprised more than 15% of the data the index might likely be ignored in favor of a full-table scan. Thus only ORIGIN of low frequency would use the index. I believe the theory goes that if a data page has, let say 100 observation, there is a good chance that an ASIA record might occur on that page. Thus using the index might end up reading all the page of the table. As such, between reading pages of the index and the pages that contain ASIA, the base enge would figure that it would be more efficient just to read through the entire table. However, I would also agree with high cardinality... would one really want to have a table for each country potential 500? Depends on your optimization/denormalization goals. Obviously, everyones mileage may vary. I might suggest a slight modification to your suggestion. For instance, maybe you do a count(*) by country and only create tables where count>100000, and create views where the count<100000. I might even go further to say only create tables where count>100000 and ORIGIN not in (&listOfLesserUsedCountries) and create views when not in that list. You could rearrange it slightly and use one data step to produce many output data sets. Thanks for sharing this improvement! Any idea if my output are all empty? Bowie, I suggest that if you're having trouble with the code and would like community help, post the question to the SAS Support Communities -- responses are always quick and helpful. I think your variant is not the best because you need to read the table sashelp.cars three times. Thank you for the comment. I agree with you, and others have pointed out similar changes that would result in one pass through the data. I was trying to keep this example simple as I really wanted to demonstrate how you can use PROC SQL to generate SAS programs based on your data values -- but I appreciate the many suggestions for improvements that I've seen here and on LinkedIn where I shared the example. The preservation of blanks in the values of ORIGIN is not necessary. The code works fine with both CATT and CATS instead of CAT. To SAS, "Asia" = "Asia "
My previous comment did not translate well. The last sentence should have included trailing blanks within the quotation marks on the right side of the equals sign. The point is that SAS ignores trailing blanks when comparing two character values for equality as long as the non-blank characters are equal. That is why CATT works since it strips trailing blanks. Had there been leading blanks (which probably would not happen in this context), then CATS may not work since it strips both leading and trailing blanks. Looks like you figured it out -- great job! ERROR: Function COMPRESS requires a character expression as argument 1. WARNING: The data set WORK.OUT_9 may be incomplete. When this step was stopped there were 0 observations and 0 variables. WARNING: Data set WORK.OUT_9 was not replaced because this step was stopped. Is the 'bucket' variable a character type or number? The WHERE= error seems to indicate it's a number, though it's enclosed in quotes in the code (treated as a char). It looks like the fix for type number is to drop the first single quote from each of these two lines. Glad you got it. I guess you ran into that because your "split" var was a number column, not a char. Welcome to the world of adapting examples! Thank you for sharing the code! I used the revised code John King made (Posted February 4, 2015 at 7:51 am) and it really gets at the heart of what I want. With that said, I was wondering if you know how to incorporate a second column into the code. For example, I am working with administrative health claims data and I want to split the master dataset by each region (I have 13 regions in all). However, I also want to split each region by the different years of data I have (2009-2015). So in the end, I want smaller datasets for each region by year (i.e. out_7_2009, out_7_2010, etc...). Excuse me if I ask silly questions (I'm new as a SAS user) but how come &COLUMN. is sometime resolve as Asia, Europe etc. and sometime resolve as the word origin? Can you explain me the differences? 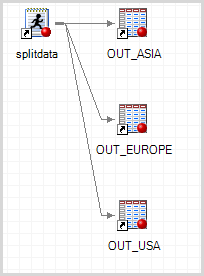 Hi Stéphanie, in this SAS macro program the macro variable represents the name of the column ("origin") -- but as the DATA step runs the value of that column in each observation is checked -- and that's where Asia, Europe, USA come in. It's two levels of indirection: the value in the record, referenced by the name of the column, referenced by the macro variable &COLUMN. Thank you for the code. I had to specify length=1024 as I ran into the CAT 200 char warning. Think it had to do with my naming convention. Sorry if I am not clear. Only started using SAS again for 2 weeks after about 2 years so still little rusty. Welcome back! Glad this helped. Great post. I'm quite new at sas. I think your way of doing this Chris H. is great cause the user don't have to anything manually and have to know all the distinct value of the variable (in this case origin), so it works on all datasets and variables. My problem is, that I would like the output to be out_1, out_2, ... , out_n so I can handle all the outputs the same way in a macro which loop over the datasets out_&i. Andreas, for that you probably need an approach that's more like my "BY grouping" tip -- use PROC SQL SELECT INTO to determine the number and names of the distinct values, and then use the number (index) as part of the data set name, while using the value as part of the filtering criteria. where can I specify output library? Because now are all datasets in WORK. I am attempting to use your code to split up my dataset by month and year (Ex. January 2017, February 2017, etc.). I have a date column in my data, but I am having a bit of trouble tweaking your code to achieve my desired result. Any help would be appreciated! You can achieve this by comparing FORMATTED values and applying a Month-Year format in the comparison. The code is a bit klunkier, but here's something that works. can you explain how can I create multiple data set without using fun. suppose there is no extra digit and spaces in column name so I. e. we are assuming only. because I am getting confuse with fun behaviour here. so I can get idea. how to implement. without using fun. I'm don't understand the question -- or what you mean by "fun" (function?) Do mean macro functions? Certainly there are other ways -- some in the comments and you can find more by asking at our SAS Support Communities.